Americans and Britons Celebrated Thanksgiving 1942 in War Weathered England - History? Because it's Here! The British may have been thankful that the Pilgrims had left England peacefully and permanently, but they didn’t follow the American tradition of celebrating Thanksgiving in gratitude for Pilgrim survival and their other blessings. American Presidents Abraham Lincoln and Franklin Delano Roosevelt designed specific days for celebrating Thanksgiving in America, and for their part, Britons celebrated successful harvests as a September Harvest Festival in churches and by having children bring food supplies to school to donate to homeless shelters. These traditions overlapped in November 1942 when the British enthusiastically helped their American allies celebrate an American style Thanksgiving in a show of wartime friendship and solidarity. By Thanksgiving 1942, the Allied forces had reason to be thankful. The Allies had won the Second Battle of El Alamein, forcing German forces under Erwin Rommel to retreat. On November 8, British and American troops invaded North Africa in Operation Torch, the first essential step in wrestling Europe from the Nazi choke hold. By Thanksgiving 1942, England had fought the Axis powers for three years, surviving the Nazi Blitz with 60,000 people killed, 87,000 seriously injured and two million homes ruined. The physical hardships of war included rationing, because German U boats blockading Britain had cut off supplies and trade. Since 1940, the British government had rationed food including eggs, fruits, vegetables, bread and potatoes. By Thanksgiving 1942, Britons were grateful to Americans for Bundles for Britain, the British War Relief in America, the Red Cross and other aid from communities and individuals. They welcomed soldiers, sailors, and airmen from the American Army, Navy and Air Force to their war-weathered homeland. Some of the American soldiers helped with harvesting and made friends with the families they aided and many shared what resources they had with their British friends. When Americans stationed in England wanted to celebrate Thanksgiving, their British allies decided to celebrate with them. During a visit to England in early November 1942, Eleanor Roosevelt articulated the importance of the spirit of unity between the United States and Great Britain. The First Lady had departed from the United States on October 21, 1942, to visit the United Kingdom to observe the wartime work of British women and to meet with United States military people stationed in England. She toured several communities and met British officials, members of the royal family and leaders of exiled foreign governments. She recorded events of her visit in her My Day column. 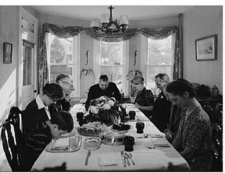 The 1942 British American Thanksgiving celebration continued to move the Allies toward this essential cooperation, but despite hopes for the future world and gains for peace in the present, Yanks observing their first Thanksgiving away from home felt that Thanksgiving came with sharply painful contours this third year of the war. Citizens of the United Kingdom also had made many sacrifices and realized that they needed to make more before the War would end. Thanksgiving celebrations would articulate these realities and cement the alliance between Americans and Britons. A story appeared in the Stars and Stripes on Monday, November 23, 1942, announcing that Thanksgiving services would be held for American soldiers in the British Isles wherever they were stationed. Quiet parish churches and vaulted abbeys with precision acoustics scheduled services. Social workers and soldiers planned afternoon parties so that orphaned British children could join in the Thanksgiving celebrations. Dinners were planned in isolated camps and service clubs and many British cities and communities hosted American soldiers. Westminster Cathedral and the new West End Synagogue scheduled services for Catholics and Jews. Since Westminster Cathedral stood close to the Houses of parliament and the transportation center of Victoria, the Germans included it on their list of Luftwaffe targets. The cathedral and the buildings surrounding it suffered extensive fire and bomb damage, but it survived. Services at the West End Synagogue revolved around bomb damage. The Germans had bombed the West End Synagogue on October 12, 1940, Yom Kippur, and bomb blasts damaged the stained glass in the east rose window. On that same day Germany abandoned plans to invade England. Five British governors of Massachusetts before the American Revolutionary War had originally come from Boston, Lincolnshire, England, and the city felt a special connection to Americans. The lord mayor, civil defense workers, and an RAF continent honored 100 workers with a parade through the streets of Boston, England. Services held at the St. Botolph’s Church of England, famous for its exceptionally tall tower which was known as the Boston Stump, and American soldiers placed wreaths at the memorial for the governors. Servicemen, church officials and civilians gathered at Plymouth, England to honor the joint Thanksgiving Day. The Archbishop of Canterbury conducted services surrounded by the ruins of St. Andrew’s Church, where some of the Pilgrims prayed before they boarded the Mayflower to begin their 3,000 mile voyage. In March 1941, the Luftwaffe had bombed and badly damaged St. Andrew’s Parish Church. After World War II, English artist and architect Frederick Etchells led the St. Andrew’s Restoration efforts and it was reconsecrated on November 30, 1957. More servicemen gathered at Plymouth to attend services in the ruins of Charles Church. The Luftwaffe had dropped fire bombs on Charles Church, the second oldest parish church in Plymouth during the night of March 20-21, 1941. After the war, the townspeople decided not to rebuild Charles Church, but rather turn it into a living memorial to the 1,200 civilians who had died during the air raids. To celebrate Thanksgiving, 1942, Lord Astor and representatives of the U.S. Navy and U.S. Army spoke in a nearby hall and a parade marched to the Mayflower Stone. A U.S. Army detachment visited Southampton and saluted at the pier where workers fitted out the Mayflower for her voyage across the Atlantic Ocean. At Plymouth, they visited the pier where the Pilgrims boarded the Mayflower. English towns like Derby, Chesterfield, Grimsby, Belfast, Wellingborough, Kettering, Northampton, Leicester, Liverpool, Ormskirk, Mansfield, Chorley, Warrington, Marlborough, Londonderry, Crewe, Norwich, Peterborough, Haywood, and Southampton held dances, luncheons and other functions. At least 30 small communities in Northern Ireland followed suit. The Rhodes House of Oxford and Tewkesbury Abby observed Thanksgiving with special services. The Lord Mayor of Southampton, England sent greetings to the Mayor of Southampton, New Hampshire, and the Lord Mayor of Portsmouth, England, greeted the Mayor of Portsmouth, New Hampshire. American Red Cross Clubs across the United Kingdom held dances and special dinners for men on pass or furlough and Army and Navy cooks cooked Thanksgiving dinners complete with trimmings for men who could not leave their duties. An Eighth Air Force unit hosted 200 orphaned and underprivileged children at a real Thanksgiving dinner. American fighting men sponsored an apple ducking and pin the tail on the donkey party and Thanksgiving dinner at the Hans Crescent Club for thirty East End children. A little over a year later, former Ambassador to England Joseph Kennedy’s daughter Kathleen would work as the Program Assistant at the Hans Crescent Club, which offered food, supplies and accommodations for officers. The London Base Command sponsored a dance at the Porchester Club and invited a young brother and sister, the first two children that the command in the Stars and Stripes Orphan Plan adopted. Soldiers and sailors at the Ashington Club in London designed Thanksgiving Day as “Appreciation Day” and cooked and served Thanksgiving dinner to the volunteer women who worked in the club. The BBC broadcasted many of the activities and not to be outdone, a radio program from the Wilton Episcopal Church in Wilton, Connecticut, featured the Bass family which had 10 of its 11 members engaged in war work. On November 23, 1942, a party of American sailors attached to the staff of Admiral Harold R. Stark viewed the history saturated interior of Westminster Abbey where British Kings and Queens had been crowned for centuries. The sailors were guests of the Dean, Right Reverend Paul Fulcrand Delacour de Labilliere who invited them for a tour. Dean Labilliere greeted the sailors outside of Westminster Abbey, and then entrusted them to his verger G.C. Drake. Verger Drake conducted the sailors through sections of the huge church, explaining the historical significance of its tombs, the apse, and statuary. The contingent of sailors included the leader Lieutenant A.J. Van Nordern, USNR, and A.B. Axson, CY; J.G. Demel, CY; H.A. Schooley, CY; R.P. Sluyter, CY; R.L. Jones, CSK; E.L. Van Landingham, CphN. ; J.T. Stuart, CPhoM; D.W. Kitchens, SK1c; G.H. Cornelius, SK1c; R.B. Spears, Y2C; C.E. Walling, Y2C; R.E. Fordyce, PhM2C; D.A. Merklin, PhM2C; C.N. Phillips, RM1C; H.M. Silverman, Y3C; G.A. Bates, AMM3C; G.E. Eaton, AMM3C;P.J. Moleison, SpC3(M); D.A. Dugan, SpC3(M); Pfc D. Erie, USMC; and Pfc G. Marker , USMC. Britons were thankful that Westminster Abbey had survived the worst German air raid on the night of May 10-11, 1941 when Luftwaffe planes had dropped clusters of fire bombs on its roof. Most of the fires were quickly extinguished and the one that burned through the lantern roof in the center part of the Abbey was eventually put out. Servicemen weren’t ordered to attend the Thanksgiving Day Service at Westminster Abbey and the newspapers carried only a brief announcement about the service, but when the church doors opened more than 3,000 men and women in uniform swarmed down the aisles. Soon all of the seats were filled and crowds stood in the side aisles. Newspapers like the Biloxi Daily Herald and magazines like Time Magazine noted that a sea of khaki surrounded the tomb of Britain’s Unknown Soldier from World War I.
Corporal Heinz Arnold, Patchogue, New York, played Onward Christian Soldiers on the coronation organ and the congregational singing included America the Beautiful and Lead on O King Eternal. Soldiers and dignitaries participating in the service included Sgt. Francis Bohannan of Philadelphia who carried a large American flag up the center aisle, Westminster Abbey Dean Labilliere, and American admirals, generals and diplomats. United States Ambassador to Britain, John G. Winant attended the Thanksgiving Day service. President Franklin D. Roosevelt had appointed John Winant ambassador to Great Britain in February 1941, and during the Blitz, Ambassador Winant had walked through blazing London streets offering help and encouragement to survivors emerging from their ruined homes and stores. The choir of American soldiers sang for services in the Westminster Abbey and later sang at the new Mostyn Red Cross Club in London.